Laffy Taffy is a candy that is one of America’s most well known brands loved by children and available in a range of fruit flavors. The candy is a modern form of taffy (or toffee) and is chewy. Laffy Taffy is packaged in a variety of formats depending on the needs of the market, smaller pieces of individually wrapped Laffy Taffy packed in a jar, or larger 1.5oz candy bars. Taffy, or toffee as it is known outside of the United States, is a sugar and butter mix boiled until it reaches a gooey consistency that can be stretched and pulled into shape, the stretching being most important as this prevents the taffy from becoming hard and more like rock candy. Nobody knows where taffy was invented, in England, Scotland, or France, we do know the first written record of taffy is found in the 1817 issue of the Oxford English Dictionary, though no mention is made if its origins. Some historians believe taffy, or at least the recipe for basic taffy without the pulling and stretching may have been around since Roman times, sugar and butter being common cooking ingredients known to have been favored by Roman and medieval cooks. Indeed, the vary basic form of hard toffee has been a favorite in Scotland since at least the time of Robbie Burns (1759-1796), although in Scotland toffee is known as tablet and is too hard to be broken with teeth, so is often sold with a small metal hammer that can be used to break the tablet into smaller pieces. The softer chewier candy we know as taffy was very popular in the mid to late 1800s and was a simple candy for local candy stores to make, and when wrapped in wax paper would keep well on candy store shelves. From the early 1800s social events that involved making taffy spread around the US, being known initially as candy pulling, and then taffy pulling by the 1870s. It was a popular pastime, especially liked by young men and women courting each other because it allowed close contact without stigma. Many a young lady is believed to have blushed as she ‘accidentally’ brushed the hand of the young man she was pulling taffy with. Taffy pulling parties have lost favor in the United States, preserved only in some smaller towns or families who enjoy the tradition, but in parts of Wales, where taffy is made using a very similar recipe to the US, and where the candy as also still known as taffy, taffy pulling parties are still an important annual event. A derivative of taffy, which is only sold in North America, salt water taffy, was originally invented completely by accident, and sounds like the sort of story that would have been written by Roald Dahl, just as modern Laffy Taffy might have been. An Atlantic City shopkeeper by the name of David Bradley was mopping up his store after a tidal wave had ruined all of his stock when a small girl came in asking for a bag of taffy. Bradley wasn’t in a good mood and suggested she take a piece of his salt water taffy, well she did, and so enjoyed the taste that Bradley created a recipe for taffy that added a table spoon of salt instead of other flavors. This was back in 1883, ninety years before Laffy Taffy was first released to the market by Breaker Confections, a subsidiary company of the Quaker Oats Company when they created the Willy Wonka range of candies to complement the 1971 release of “Willy Wonka and the Chocolate Factory” starring Gene Wilder. 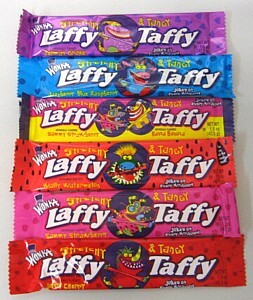 The Willy Wonka range of candies were created to complement the story by Roald Dahl and were packaged with bright labeling and psychedelic colors, the Laffy Taffy being no different, although the Laffy Taffy candy bars also included a joke on each wrapper to reinforce the connection of the word Laffy with laughing. After the successful launch of the Willy Wonka Brand, Breaker Confections invited children around the United States to send them their favorite jokes, the best of which would be printed on Laffy Taffy wrappers. The jokes were credited to the children who sent them in, and without exception were all based on puns and wordplay, examples include “What did the plate say to the other plate? Lunch is on me”, or “What did Delaware? A New Jersey”. In 1980 Breaker Confections officially changed its corporate name to Willy Wonka Brands, and in 1988 after the company was sold to Sunmark (now a division of Nestlé) the name changed again to Willy Wonka Candy Company which is the name now appearing on all Willy Wonka branded candy in the US, Canada, the United Kingdom, Australia, and New Zealand, all countries where Roald Dahl’s books have become popular favorites. A cartoon character of Willy Wonka showing off his factory featured in television advertising for all of the Willy Wonka branded candies produced by the Willy Wonker Candy Company. Each ad showed a fantastically elaborate production line and finished with Willy Wonka holding up the candy bar while an Oompa-Loompa says “What will he think of next?”. Roald Dahl’s catchphrase for Willy Wonka “It’s Scrumdidilyumptious!” appeared on product merchandising on store shelves, and also on posters and billboards for the movie. Laffy Taffy has been a popular candy since its launch, though the release of the 2005 movie “Charlie and the Chocolate Factory” starring Johnny Depp helped flagging sales of the candy bar and established a new generation of Laffy Taffy fans. At the same time Nestlé released a chocolate Wonka Bar some of which included a gold ticket as in the movie. Laffy Taffy candy wasn’t included in the golden ticket promotion. 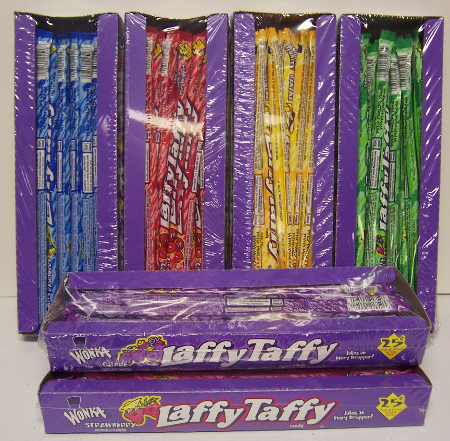 In 2005 a new variant of Laffy Taffy, the long cord, arrived on store shelves to complement the smaller rectangles shaped bars. Flavors of Laffy Taffy include cherry, strawberry, grape, banana, blue raspberry, and sour apple.